I've been using Paprika Recipe Manager from Hindsight Labs on my iPad for a couple of months, and I've found it's turned my iPad into an invaluable kitchen tool. The only drawback to the app has been that the iPad's touchscreen keyboard made entering recipes by hand somewhat cumbersome. That won't be an issue anymore, because Paprika Recipe Manager is now available in the Mac App Store. Those familiar with Paprika on iOS devices won't find any surprises. The interface is largely the same, though obviously optimized for the traditional mouse/keyboard setup on the Mac. If you haven't used Paprika on any device and you do a lot of cooking, you'll find it an invaluable tool that goes beyond mere recipe management. You might look at an app like Paprika and think, "Why pay for that when I can just enter everything in Excel or something?" That's a fair question, and Paprika's features go a long way toward answering it. The app's built-in template allows you to enter ingredients, instructions, prep time, cook time, and serving sizes manually, but Paprika's powerful, built-in web browser will "grab" recipes from many sites with a single click. To get started, click on the Browser tab in Paprika's side bar to bring up Google (you can change the app's search options via the preferences). Next, simply search for a recipe. If you find one on a site that Paprika supports, click "Save Recipe" in the upper right-hand corner to import it into Paprika's database. 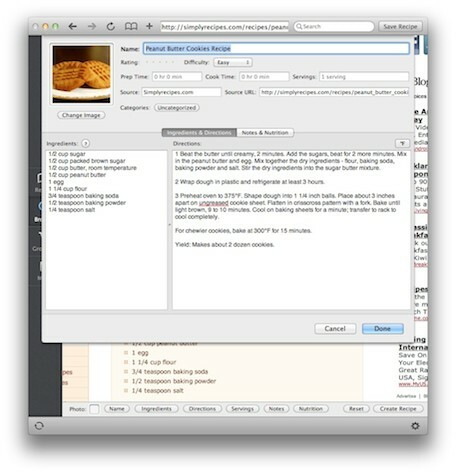 You've just created an entire recipe with a single click. This one-click function supports many sites, but if you've found a site isn't part of Paprika's database, all is not lost. You'll find individual clipboard buttons for Name, Ingredients, Directions, and so on at the bottom of the screen, which you can fill in as needed. It's slower than the one-click solution, but still faster than adding a recipe entirely by hand. Like a few other recipe manager apps, Paprika also includes a meal planner, a grocery list function that allows you to add recipe ingredients to your shopping list with one click, and a "scale" function that will allow you to scale recipes up or down depending on how many servings you want to make. This last function can occasionally get confused by recipes with both U.S. and metric measurements, so you may still have to dust off your second-grade memories of fractions. As someone who owns the iPad app, I'm interested in Paprika's syncing service. It's been available on the iOS apps for some time, via a US$9.99 per year in-app purchase. Paprika for Mac comes with this service enabled for free, and once you've created an account on Paprika for Mac you can share information on your iOS device(s). 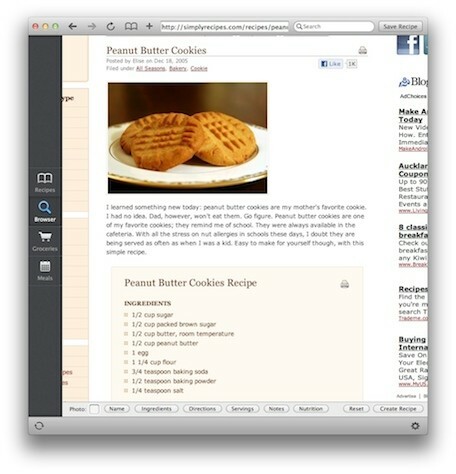 To send recipes to your iPad or iPhone from your Mac, just click the syncing icon in the lower left of Paprika's window. This feature alone makes Paprika for Mac invaluable. Creating and managing recipes on the Mac is easier than it is on the iPad, but carrying my Mac into the kitchen is out of the question. Being able to sync everything to my iPad is a killer feature. At US$19.99, Paprika is significantly pricier than its iOS equivalents, but it's priced well in line with similar Mac apps. The only possible stumbling block for potential buyers is that Paprika requires OS X Lion. Anyone still running Mac OS X Snow Leopard is out of luck. The interface is also very mouse-driven, which may be a potential turnoff for the keyboard enthusiasts out there. Recipe manager apps have been around for a long time, but Paprika's one-click recipe downloader and cloud syncing with the iPhone and iPad are worth the price of admission by themselves. If you're like me and you spend a lot of time in the kitchen, Paprika is definitely worth a download.